On Thanksgiving Day, elders and sisters at missionary training centers around the world feasted spiritually on words of counsel from an Apostle and his wife. Later that day, at the Provo MTC, missionaries helped nourish others physically as they packed ingredients for 350,000 meals to be distributed to the needy through the Utah Food Bank. 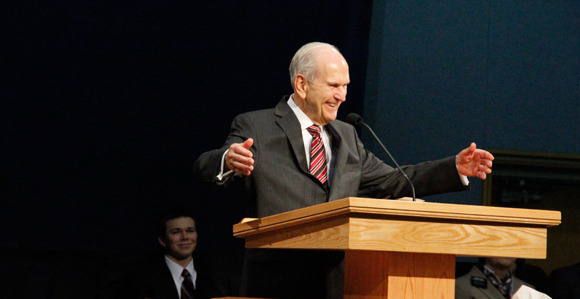 “Teaching and baptizing lead to thanksgiving that never ends,” declared Elder Russell M. Nelson of the Quorum of the Twelve Apostles in the live broadcast emanating from the missionary training center in Provo. His talk followed one given by his wife, Sister Wendy Nelson, who counseled the missionaries to put away childish things.